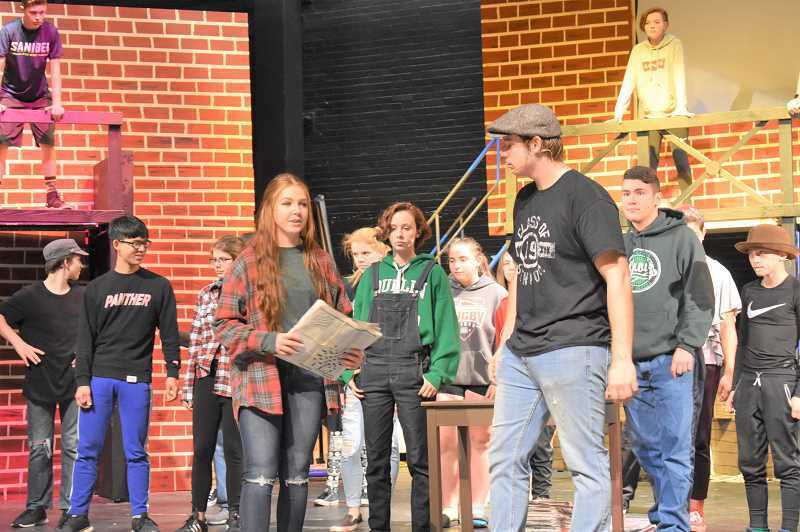 With their latest production, the Estacada High School Performing Arts Department will take audiences to New York in 1899, where newspaper delivery boys are reacting to an increase in the prices they have to pay to complete their jobs. "Newsies" follows Jack Kelly (James Rich) and his fellow newspaper delivery boys, including Crutchie (Grant Wagner), Davey (Carson Beguelin) and Les (Henry Reidel). The group decides to go on strike after New York World publisher Joseph Pulitzer (Eric Sohnery) increases the cost of the newspapers they need to purchase prior to delivering them. Along the way, Jack visits a Vaudeville-style theater owned by Medda Larkin (Daisy Burnett) and meets reporter Katherine Plumber (Briana Wallace), who eventually writes about the strike. The musical is based on the Disney film of the same name, which in turn was inspired by the New York newsboy strike of of 1899. Co-directed by music teacher Rendell Frunk and theater teacher Jordan Collins, "Newsies" runs from Thursday, Nov. 15, through Saturday, Nov. 17, at the Estacada Auditorium, 500 N.E. Main St. It begins at 7 p.m. each night, with an additional show at 1 p.m. Saturday. Tickets are $8 for adults, $6 for students and seniors and $4 for children 12 and younger. "Newsies" cast members have appreciated many aspects of their characters. "(Katherine is) really headstrong. She's one of the first female reporters writing hard news," said Wallace, noting Katherine doesn't let her relationships interfere with her work. Rich appreciates that Jack is an "outgoing, strong leader." Burnett compared Medda Larkin to Aretha Franklin, noting that "she's kind of sassy, but maternal," she said. They also enjoy the show's musical elements. "There's a lot of group work (with the music)," Wallace said. "Everybody is involved in it and has excitement." Burnett enjoys the dynamic chorus. "The newsies are such a fun chorus group. In most shows the chorus is kind of bland, but the newsies are fun to pay attention to," she said. Directed by Rendell Frunk, the show's pit orchestra includes musicians David Berra, Kyrnan Frunk, Julien Purvis, Megan Holmes, Elizabeth Krieter, Chris Stevensen, Laura Recklies, Sam Fisher, Kenneth Fisher, Paul Trubichik and Kendra Reinhold. "Newsies" is Collins' first production with the Estacada High School performing arts department, and she's happy to be involved with it. She likes the wide range of skills the play allows the student actors to showcase. "The different music and dance styles that are emphasized on stage as well as the artistic skills needed to prepare the stage have required them to use all of their various abilities," she said. "We've been able to showcase tap-dancing and acrobatics and even required students to speak with a New York(ish) accent. This show is so massive and high-energy, but the students are really stepping up and putting their best effort into every minute of it."